Linked audio file providing the child's voice inflection and accent. Please take a moment to view the SafeAssured ID Brochure which includes a list of donors who have supported this program and helped to bring it to our community. Please go to our website events calender and type in "SafeAssured ID" to find out when future events will be held. Please print and fill out the SafeAssured ID Enrollment Form prior to the event. The annual Kid's Fishing Contest sponsored by the Wisconsin Rapids Police Department and the Wisconsin Rapids Professional Police Association is held just prior to the Annual Cranberry Blossom Fest Sunday Parade in June. Held along the east river bank, it is a day of fishing, fun, and refreshments. Kids 14 and under come and fish with WRPD Officers. 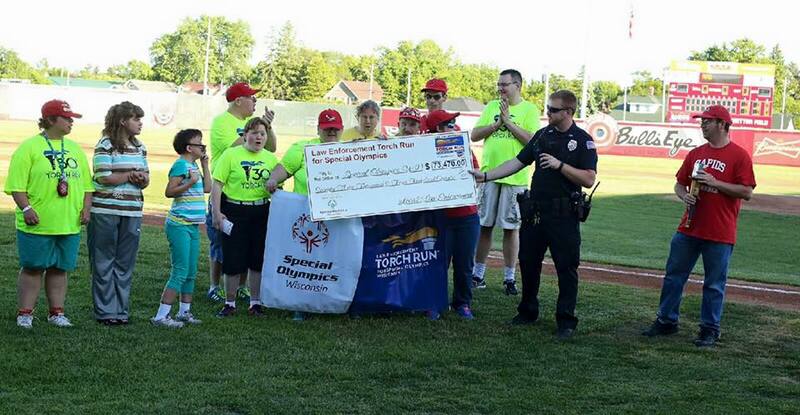 Many members of the Department volunteer their time and effort each year to raise money for Local Special Olympic Athletes.